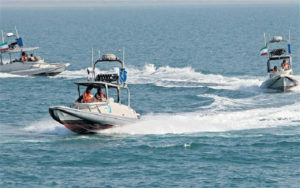 U.S. Republican presidential nominee Donald Trump vowed to “shoot out of the water” any Iranian vessels that harass the U.S. Navy, if he is elected. At a rally in Florida on September 9, Trump said he would make the U.S. military “so strong that nobody’s going to mess with us,” and cited recent incidents where the Pentagon said Islamic Revolutionary Guards Corps boats acted aggressively toward U.S. ships. “When they circle our beautiful destroyers with their little boats, and they make gestures at our people that they shouldn’t be allowed to make, they will be shot out of the water,” Trump said. “We’re going to put us in a position of leadership of the world again so we can negotiate from a position of great, great strength,” he said. Trump also mentioned an incident this week in which a Russian fighter jet came within 3 meters of a U.S. plane over the Black Sea. Russian President Vladimir “Putin laughs, believe me, he laughs at our leaders. Yesterday, he had a plane [3 meters] away, taunting us, toying with us, just like Iran,” Trump said.